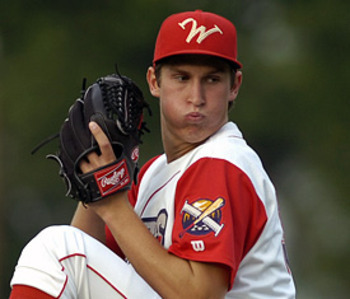 The Phillies selected Jon Pettibone in the third round of the 2008 Amateur Draft. He attended Esperanza High School in Anaheim, Calif. The 21-year old, 6’5 right-hander is having the best season of his four-year minor league career. His father, Jay Pettibone, had a short four-game stint in the bigs for the 1983 Minnesota Twins. Charlie Manuel managed Jay in 1984 for the Orlando Twins, Minnesota’s Double-A affiliate. Jon Pettibone hopes to play for Manuel a couple years from now for the Phillies. Jon Pettibone has quietly matriculated his way up the ranks. Not only has he moved up a level each year, he’s improved each season. “Every year, I’m having a great time and learning a lot. It’s definitely been a success and fun so far,” Pettibone said. He’s cut down on his walks and home runs, and improved his strikeout rate and ERA from last season. He isn’t as heralded as the big three arms in the system (Brody Colvin, Trevor May and Jesse Biddle), but his numbers aren’t too far off, if not on par with those three. Pettibone pitches to contact and lets his defense do the work behind him. He also touched on throwing to the defensively improved catcher Sebastian Valle. In the last five years, the Phillies have landed behemoths such as Roy Halladay, Cliff Lee, Roy Oswalt, Brad Lidge and the recently acquired Hunter Pence via trade. During that time, they’ve also sent away a plethora of prospects. He commented on losing teammates Jarred Cosart and Jonathan Singleton. From a Threshers point of view, they’re in the playoff hunt and losing those two key cogs hurt. Clearwater stands at 64-54 on the season, and 25-24 in the second half, 1.5 games back of Dunedin Blue Jays. The second-half division winner will take on the Daytona Cubs, the first-half winner in the postseason. 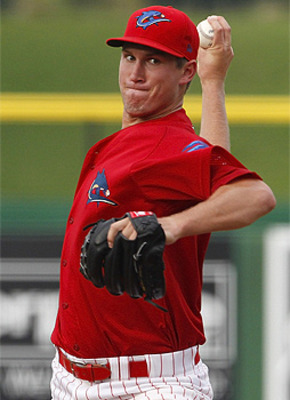 Pettibone has playoff experience during his stint in Lakewood last season. 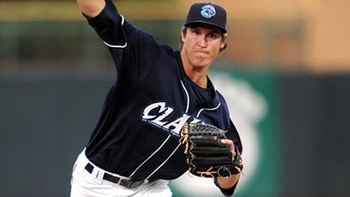 He tossed six no-hit innings and recorded a career-high nine punchouts in the series-clinching game that sent the Blue Claws to the South Atlantic League Championship Series. As for Pettibone’s new roommate, it’s the recently promoted David Buchanan. Bright House Field, the home of the Clearwater Threshers, played host to Florida State League’s 50th All-Star Game. Jon Pettibone got the nod as the starter for the North. He came into the contest fourth in the FSL in ERA (2.47). “It was pretty neat that they let me start the game at my home field. It was a big honor and it was nice to stay local,” Pettibone said. He set the South down in order in his only inning of work. Pettibone, along with teammates Jarred Cosart, Trevor May and Julio Rodriguez, combined to pitch four innings of shutout ball. The North defeated the South 5-3. Several key Phillies players have played down in Clearwater as part of rehabbing assignments this season. Chase Utley, Carlos Ruiz, Roy Oswalt, Ryan Madson and Joe Blanton have all laced up their spikes at Bright House Field. Pettibone talked about what he learned from the pitchers. “Madson was down with us a couple of weeks ago, I spoke with him a little bit. Blanton’s been down. I picked their brain and asked as many questions as I can. What they do and how they go about their business,” he said. Earlier on in the season, the Phillies participated in the well documented 19-inning thriller against Cincinnati. Well, the Threshers took part on the losing end of a 2-1 23-inning loss against Jupiter. Each squad used eight pitchers. The game took five hours and 37 minutes to complete.